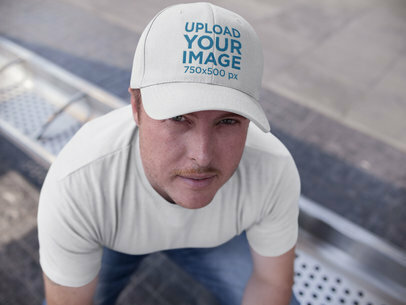 How about placing your logo on this cool hat mockup! Try it now by simply placing your image over the mockup template, you'll have a download ready in no time. Get more out of your budget when you use apparel mockups to build your own advertising strategy. Use our mockup generator and save hours of production for less money! To see another Hat Mockup click here! 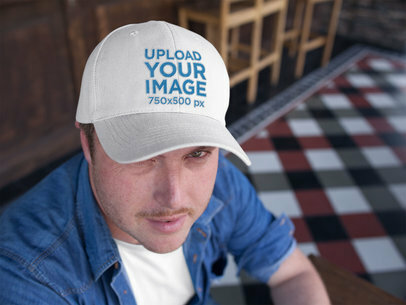 Get your logo on this hat mockup in just seconds when you use our mockup generator to create your own mockups! 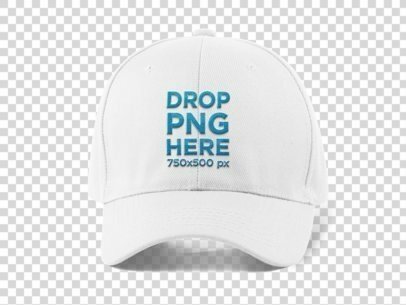 This hat mockup features a dad hat in angled position over a transparent background, the perfect visual asset to promote your brand in a modern and more realistic way than ever. Imagine all the mockups you could use to display your latest artwork, go ahead and drop your image over the template to see how it works! To see another Hat Mockup click here! 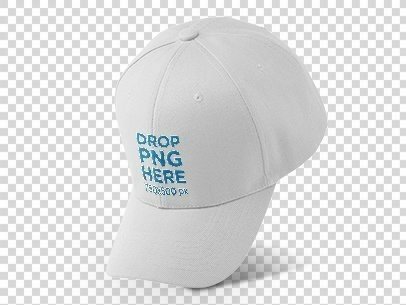 Have you seen this new dad hat mockup featuring a guy covering his face against a white background? 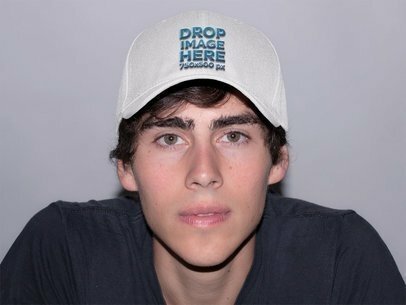 It's a pretty cool shot to display your new logo or designs on an embroidered hat, plus it's very easy to use, all you need to do is drop your image over the mockup template and your final asset will be ready in no time! To see another Hat Mockup click here! 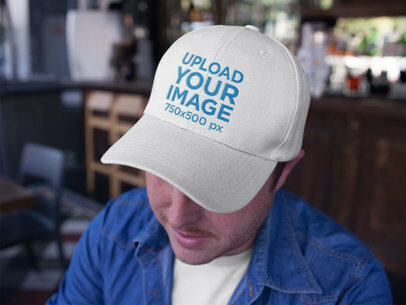 Check out this awesome mockup featuring a dad hat being worn by a guy at the bar, it's a great image that you can use to promote your latest design in a cool and urban way. Start now! All you have to do is just use the menu on the right to choose the tshirt and the hat color, then upload your design using the menu on the left, it'll also let you remove a black or white background from it! Amazing, isn't it? Try another Hat Mockup! Create your own apparel mockups with our handy mockup tool with hundreds of mockup templates to choose from! 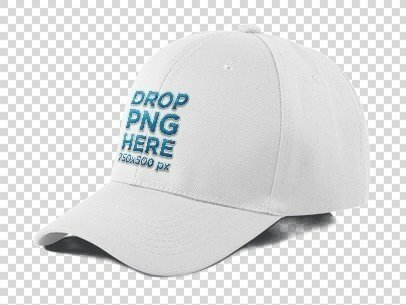 Take this mockup of a dad hat worn by a young white guy staring vaguely at the camera to advertise your latest clothing brand designs. It's very easy to customize, all you do is drag and drop your artwork over the mockup template and done! It's that simple. To see another Hat Mockup click here! 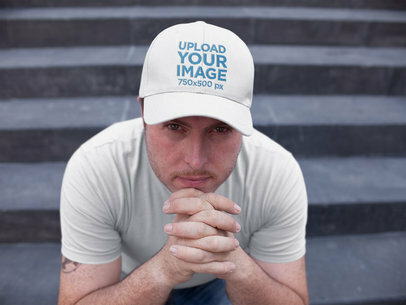 Check out this awesome mockup featuring a white guy sitting down on concrete stairs while wearing a dad hat and praying. Start using it now and make your income grow! All you have to do is choose the tshirt and the hat color with the menu on the right, then upload your design using the menu on the left. Don't forget to remove the black or white background if you need it too! Try another Hat Mockup! What are you waiting for to personalize this mockup with your own apparel designs? Try it out by simply dragging and dropping your artwork over the mockup template, PLaceit's mockup generator will have your asset ready in no time! Get more out of your budget when you start using photo mockups to advertise all of your latest products! Your clothing brand is going to stand out without a doubt. To see another Hat Mockup click here! This young white girl wearing a hat while having fun in a hallway is an awesome choice for you to showcase your latest hat designs. All you need to do is drag-and-drop your image file on this interface, Placeit will merge it in just seconds! Try another Hat Mockup! 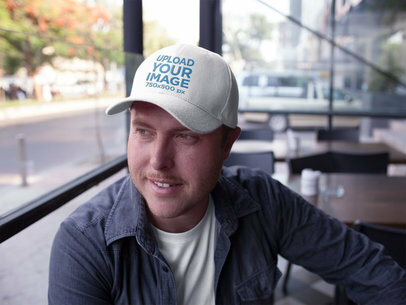 Check out this awesome mockup featuring a dad hat being worn by a happy white guy at a restaurant, this image is ideal to sell your latest design in a beautiful way. Start now and make your revenue grow! 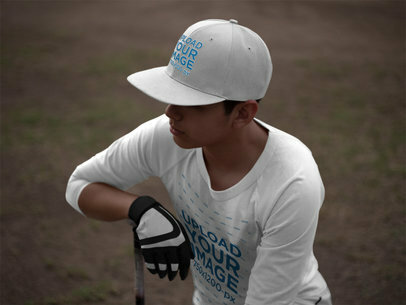 The menu on the left will let you upload your design and remove its black or white background, and don't forget to choose the tshirt and hat color with the menu on the right. Use Placeit and make your income grow! 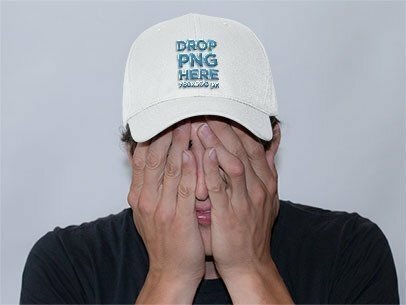 Try another Hat Mockup! 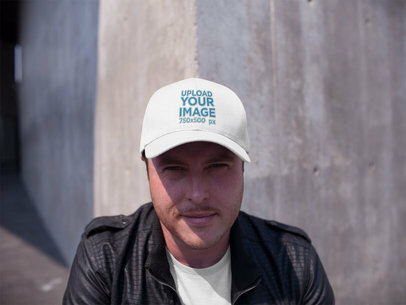 Check out this template featuring a white guy wearing a snapback hat while standing against a concrete wall, it's a really cool visual that you can use to promote your ideas in a beautiful way! All you have to do is choose the t-shirt and the hat color using the menu on the right side of the page, then upload your design or logo using the menu on the right, with which you can also remove the black or white background off of it as well. Start using Placeit and make your income grow! Try another Hat Mockup! Start showcasing your latest logo or design using Placeit! 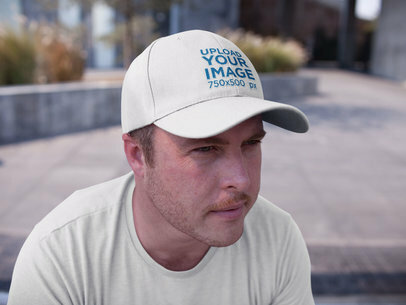 This mockup shows a white guy wearing a dad hat while sitting down outdoors, it's a really cool visual that you can use to promote your latest image to your audience in a cool and professional way. 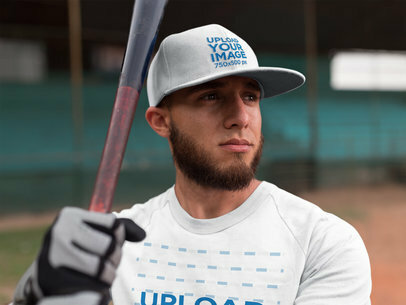 All you have to do is choose the tee color and the hat color with the menu on the right, then upload your design and remove the black or white background from it as well using the menu on the left. Amazing, right? Start now and make your income grow! Try another Hat Mockup! Take a look at this mockup featuring a middle-aged man wearing a dad hat and a denim shirt, it's a gorgeous visual that you can start utilizing to promote your latest designs in a casual and visually appealing way. 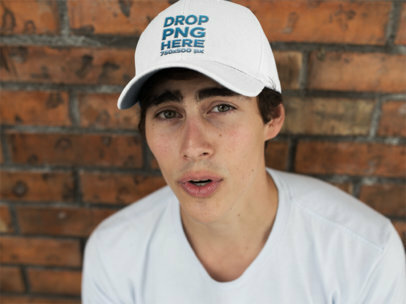 Use the menu to the right side of the page to choose the tshirt and the hat color, then upload your image and remove its black or white background with the menu on the left. Use Placeit now and make your income grow! Try another Hat Mockup! 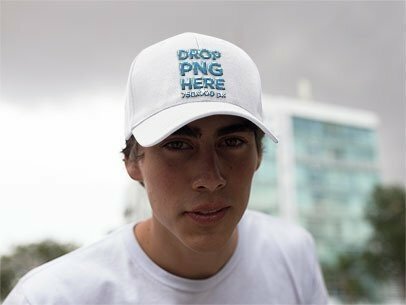 Check out this awesome mockup featuring a man looking to the horizon while wearing a dad hat, it's a gorgeous visual for you to promote your latest design. Start now! All you have to do is upload the image with the menu on the left, and if you need to remove its white or black background the same menu will do that for you. Amazing, isn't it? Choose the tshirt and the hat color with the menu on the right. Try another Hat Mockup! 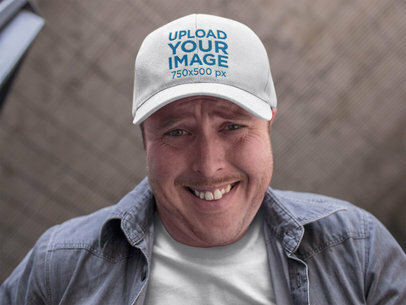 Take a look at this mockup of a smiling middle-aged dude wearing a dad hat while indoors, it's a really cool visual that you can use to promote your latest design or logo in a photorealistic way. Use realistic images to display your logos in a way that your customers will love. Start now! The menu on the right will let you choose a hat color, and the one on the left will let you upload a design and remove its black or white background too. Amazing, right? Try another T-Shirt Mockup! 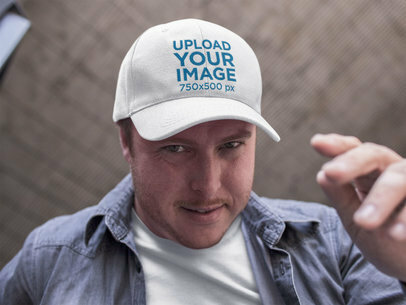 Check out this awesome mockup featuring a middle-aged man about to hold his hat, it's a really cool visual that you can use to promote your latest design or logo in a creative and high-quality way. Start now! You will be able to upload your design with the menu to the left, and remove its black or white background too! The HEX tool to the right side of the page will let you choose the hat and tshirt color. Try another T-Shirt Mockup! 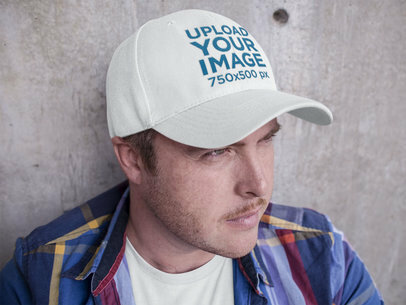 Take a look at this cool image featuring a happy white man looking to the camera while wearing a hat against a concrete wall, it's a cool option that'll make your revenue grow! Showcasing a photorealistic image is a great choice to increase your conversions. Use it now! 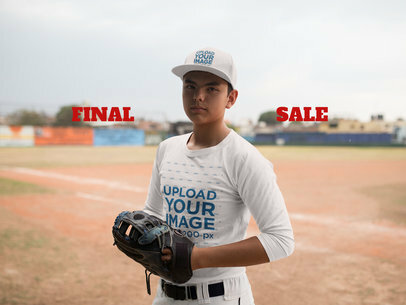 The menu on the right will let you choose the tshirt and the hat color, then upload a design and remove its black or white background using the menu on the left. Amazing, right? Try another Hat Mockup! Promote your designs with Placeit! 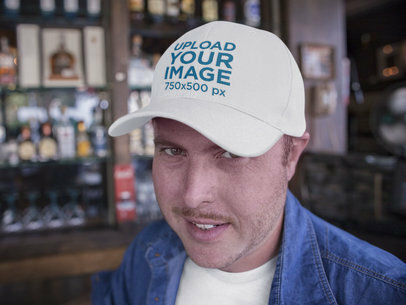 This mockup features a middle-aged guy with a dad hat at a bar, it's a gorgeous visual that you can share to promote your design in a cool way. Use it now and make your income grow! The menu to the left side of the page will let you upload your design and remove its black or white background, and the one to the right will let you choose the tshirt and hat color. Use Placeit and start selling more! Try another Hat Mockup! Check out this beautiful mockup featuring a middle-aged guy wearing a dad hat while sitting down at a bus stop, it's a really cool pic! Promote your design with it, all you have to do is choose the tshirt and hat color with the menu on the right, then upload your design and remove its black or white background with the menu on the left. Super easy, right? Try another Hat Mockup! 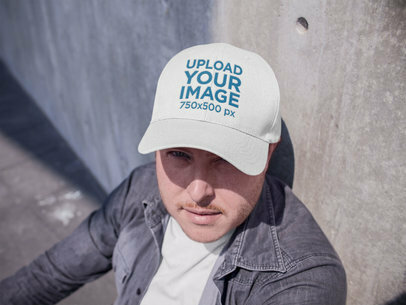 Take a look at this beautiful mockup featuring a middle-aged white guy wearing a dad hat while lying against a concrete wall, it's a really cool visual that you can use to promote your latest designs in an urban and visually appealing way. Start now! The menu on the left will let you upload your design and remove its black or white background, the menu on the right will let you choose the tshirt and the hat color! Try another Hat Mockup! 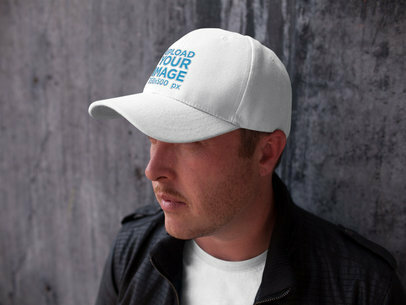 Check out this awesome mockup featuring a front shot of a white guy wearing a hat while standing against a concrete wall, it's a really cool visual that you can use to promote your latest design or logo in a great way. Start now and make your income grow! 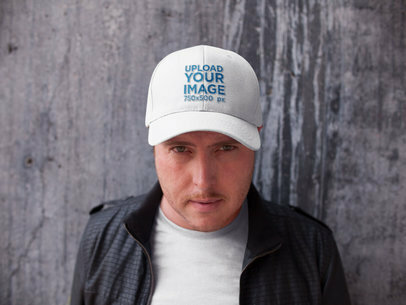 You can choose the tshirt and the hat color using the HEX tools on the right, then upload your image and remove its black or white background off of it with the menu on the left. Awesome, right? Try another Hat Mockup!